Friday Tip: Reverb Chord Progressions? Why Not! One very useful Studio One feature is being able to record a track output into another track’s input. I take advantage of this sometimes by recording effects like reverb or envelope filter (set to effect sound only) into a track. 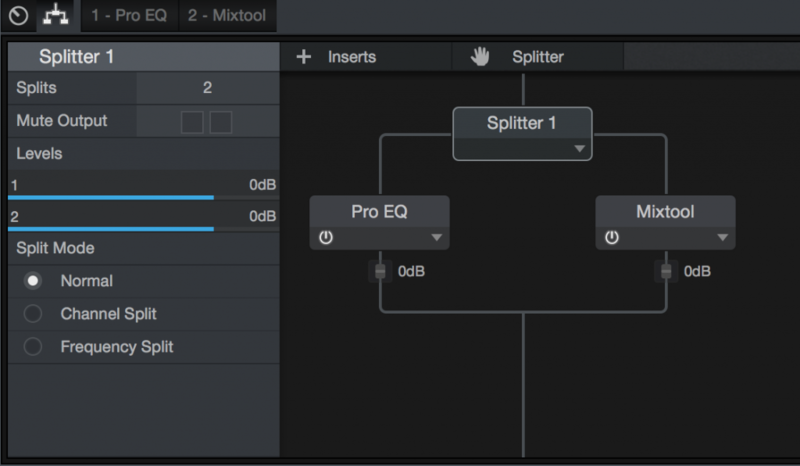 This allows using Inspector features like transpose and delay, as well as have easier control during the mix. So imagine my surprise when I set the reverb-only track to follow the Chord Track—and ended up with a tuned reverb chord progression! The following audio example gets the point across. The first four measures have the original reverb sound, the second four measures have the reverb processed by the Chord Track…pretty amazing. There’s one caution: The only Follow chords mode that works for this is Universal. The Tune Mode doesn’t seem to matter, so I just use Default. Extra bonus coolness tip! 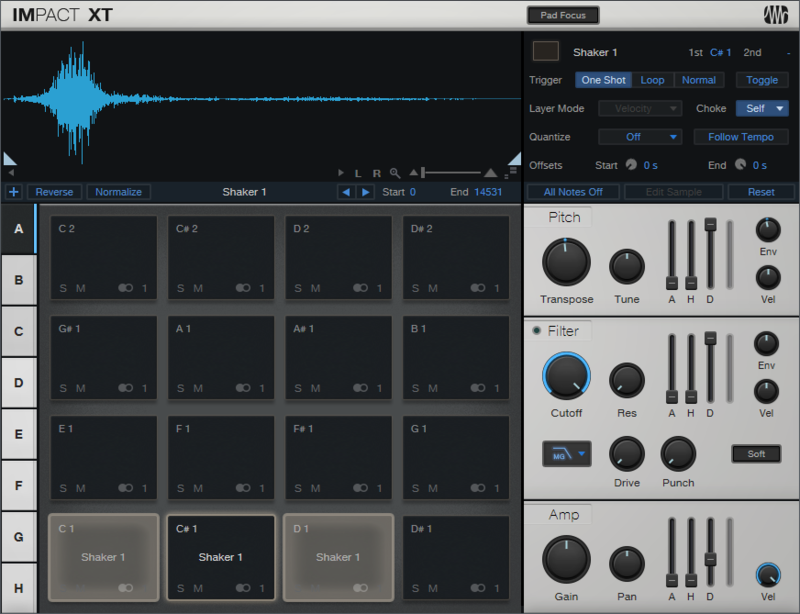 Drums can follow the Chord Track, again in Universal Mode, for a “drumcoded” effect (i.e., similar to drums “vocoding” something like a pad). 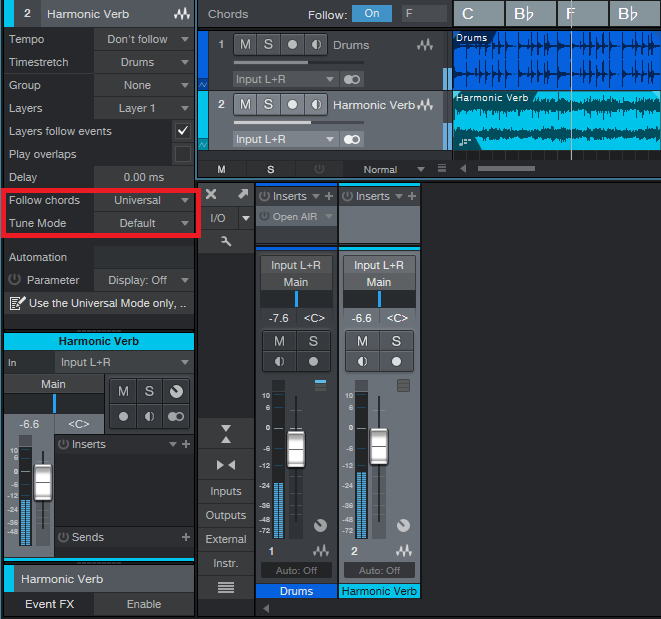 Although there’s no way to do a wet/dry balance of the melodic and non-melodic components, you can copy the track, have only the copy follow the Chord Track, and adjust the mix between the dry and Chord-Track-following track. There are several ways to convert stereo into two mono tracks with Studio One (e.g., for processing the two channels separately, reversing one channel but not the other, etc. ), but those ways can be somewhat convoluted. One simple way to convert a stereo track into mono involves going into the Browser, right-clicking on the track’s filename, and selecting Split to Mono Files. But if a track consists of multiple clips from multiple files, then you first need to bounce them to create a track—yet you might not want to bounce them until later. And you’re also creating additional files. The approach in this tip doesn’t create true mono tracks, but it treats a stereo track as two different tracks that behave exactly like mono tracks—which is probably the desired goal anyway. This method also doesn’t create any additional files, and is non-destructive. 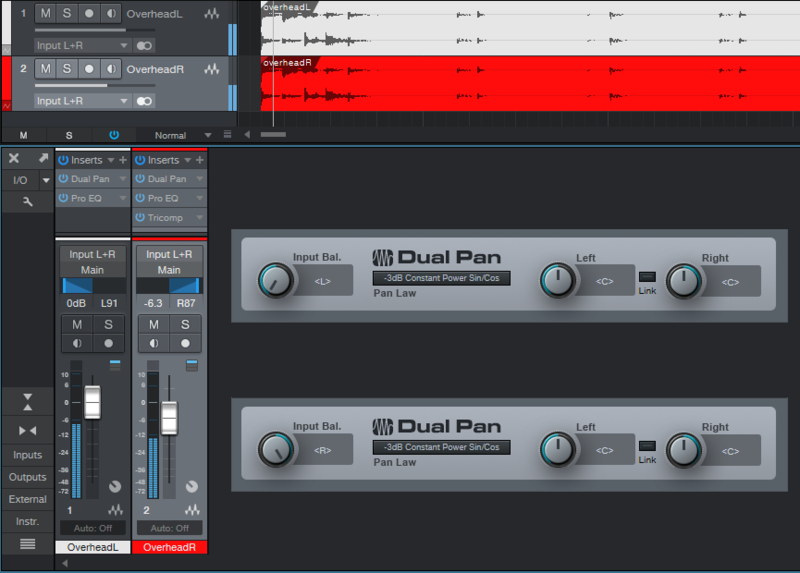 Insert a Dual Pan into your stereo track. Set Input Balance to Left (fully counter-clockwise), and the Left and Right controls to Center. Select the track and choose Duplicate Track (Complete). In the duplicated track, set the Dual Pan Input Balance to Right (fully clockwise). 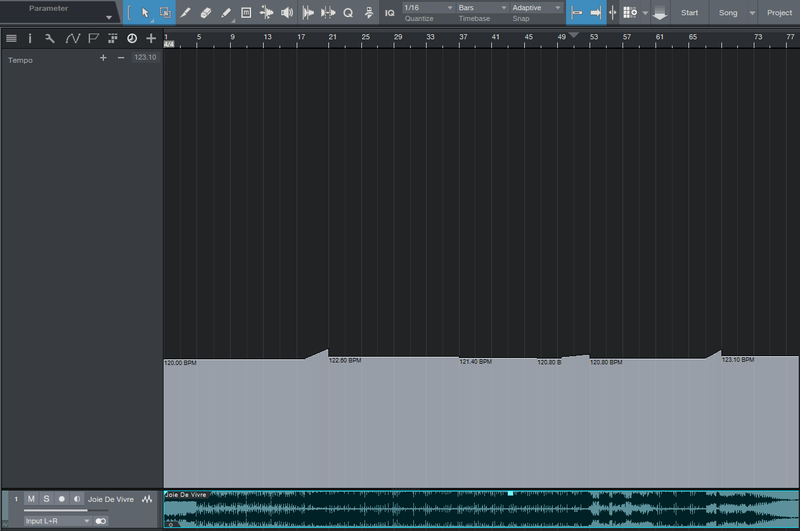 The original track becomes the left channel and the duplicated track, the right channel. Now you can process and pan each channel individually. To avoid confusion, rename one track so it includes the letter L, and the other so it includes the letter R. In the screen shot, the right track is red and the left track is white to follow the color scheme of RCA phono jack stereo connections in consumer electronics devices. Hey, why not? Okay, Studio One isn’t lacking for reverb. Nor is the rest of the world. 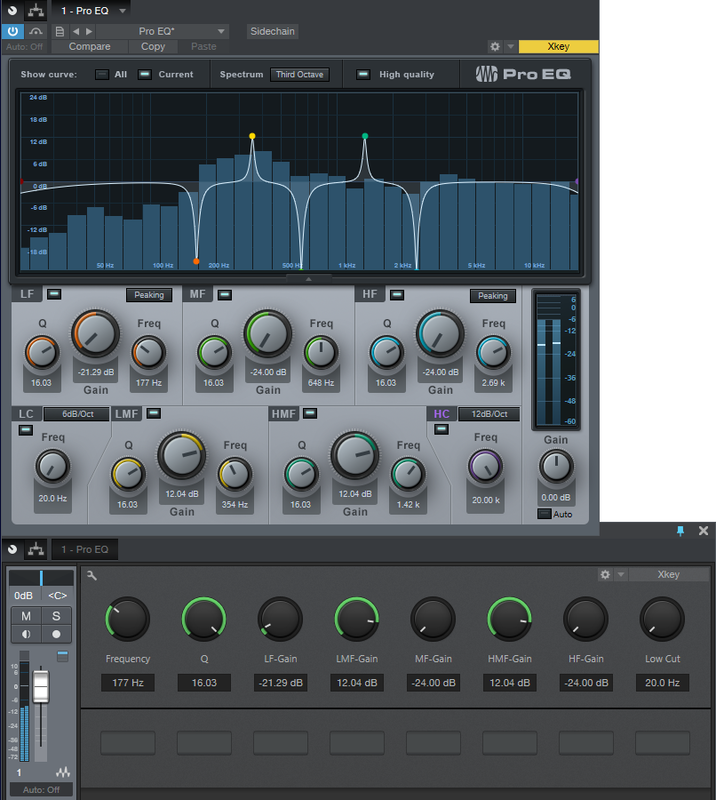 But we also aren’t lacking for tools to make new kinds of reverb sounds, and that’s what this week’s tip is all about. Note that the TonalVerb is a bus effect, so don’t insert it in a track. (Or, do insert it in a track—you never know what might happen!) As with last week’s tip there’s a preset you can download, but I recommend reading about how this preset works. FX Chains are very powerful, and once you learn what you can do with them, you can create your own signature sounds instead of sounding like everyone else. A Splitter, set to Normal mode, feeds two Mixverbs in parallel. One of the parallel paths goes through a Mixtool with both channel phases (polarities) inverted, so the summed audio cancels. Except… one Mixverb has damping fixed at 50%, while the other is variable (as set by the FX Chain Tone control). With both Damp controls at 50%, there’s no audio due to cancellation. However setting damping below 50% cancels the low frequency reverb components, yet the high frequency reverb components remain. With damping set above 50%, the reverse occurs—the high frequency reverb components cancel, while the low frequency components remain. The closer Tone is to 50%, the greater the cancellation so you may need to increase the bus level under these conditions. This effect is very different compared to altering tone via equalization for several reasons, but the main one is that damping varies over time. At the onset of the reverb, there’s more cancellation because the two parallel signals have more in common. This reduces the attack of the signal being reverberated, which has its own uses—for example, you might want the crack of a drum to be more prominent, rather than being washed in reverb. With tone set to 0% and Size at a relatively high value (e.g., 70%), it’s almost like the reverb has an attack time of its own. Regarding the other FX Chain controls, Predelay, Size, and Width all vary their respective Mixverb controls simultaneously over their full ranges. The only one that works differently, as noted above, is the Tone (damping) control. So… why be normal? 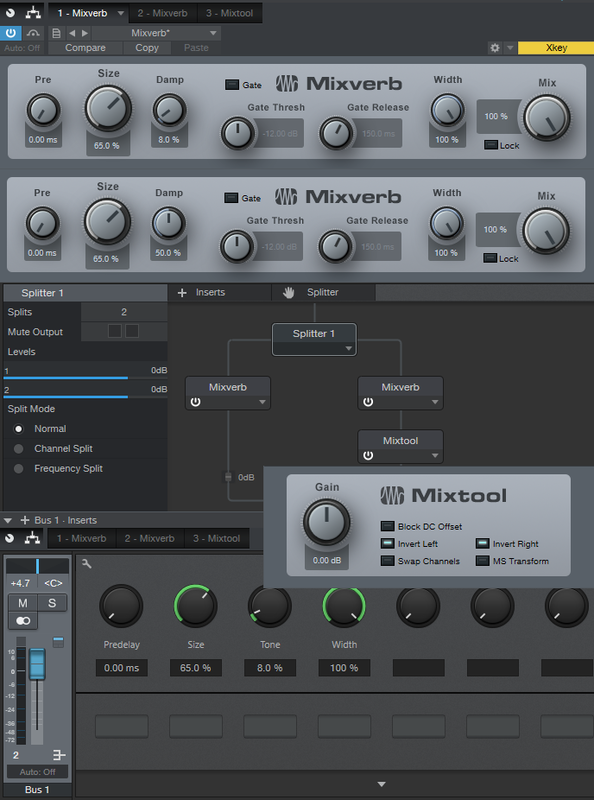 Here’s your chance to try a different type of reverb sound that’s especially well suited to EDM productions. Click here to get the Multipreset! I’ve been experimenting with phasers lately, and found some interesting tricks. This week we’ll create a mind-melting phaser-meets-stereo-imager. Next week, we’ll create a super-customizable phaser with continuously variable peaks and notches, so you can obtain specialized vintage sounds like the original Electro-Harmonix Polyphase. 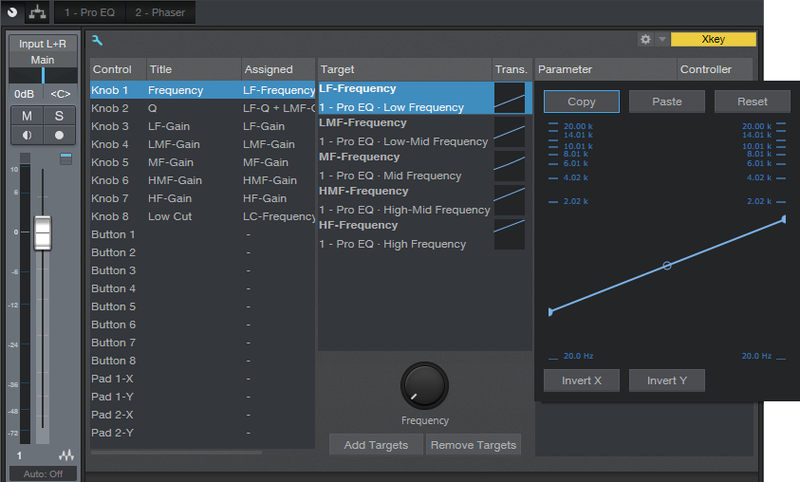 You can reproduce the sound of a phaser with several tracking notch filters, so instead of using a phase shifter per se, we can use the Pro EQ. The five parametric stages are set up as notch filters one octave apart, with a sweep range of four octaves. 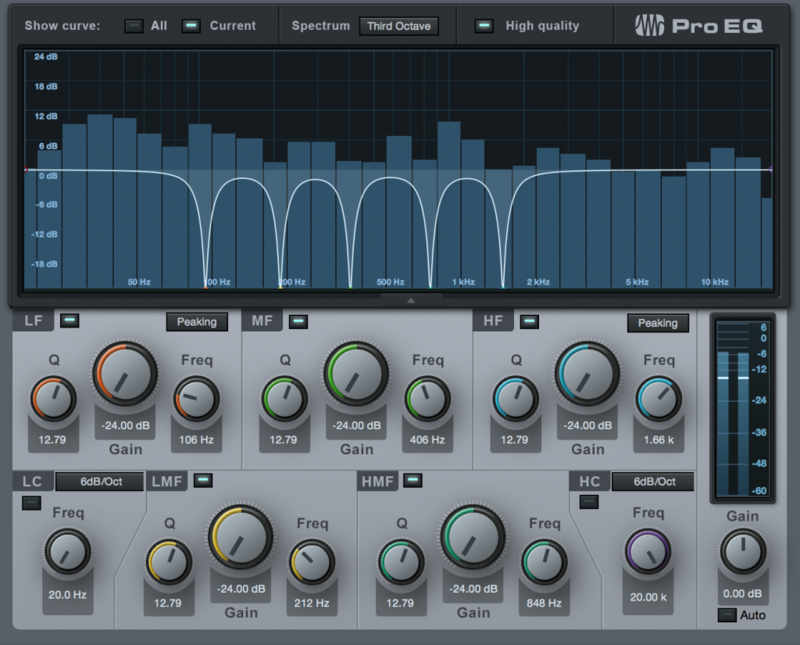 The FX Chain Frequency control sets their frequencies. If you download the multipreset, I highly recommend reverse-engineering it to see how to control multiple filter stages from a single knob. The FX Chain Q control sets the phase effect’s resonance/sharpness by altering the Q for all five stages simultaneously. Broader Q settings reduce volume, with a less focused, gentler phasing sound. High Q settings are sharper, with a more pronounced phasing effect. But the secret ingredient here is splitting the signal path into the Pro EQ-meets-phaser and the Mixtool. 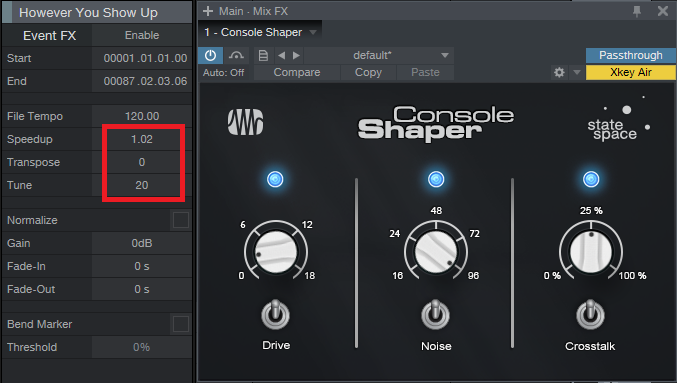 Inverting the phase for the Mixtool’s left and right channels cancels out any remaining dry signal from the Pro EQ “phaser,” which accents the phasing sound. If you compare this to the sound of the PreSonus Phaser, it’s like the PreSonus Phaser supplements the audio with the phasing effect, while the Imaging Phaser replaces the audio with the phasing. They both have their uses. The real mind melt happens if you run program material through the Imaging Phaser and then click the Image Xpand button. This swaps the right and left channels, which because they’re out of phase, creates insane imaging effects. The first time I tried this was on a laptop, and clicking on Image Xpand made it seem like the speakers were located somewhere else in the room. The effect is less dramatic with signals that don’t contain a lot of stereo information and ambiance, or on headphones, but it still makes a difference. The first part showcases the phaser effect. After the word “Reunited” appears, you’ll hear an unprocessed version of the track for four measures. After that, it’s Image Xpand time, with the FX Chain control being varied to alter the sound somewhat. 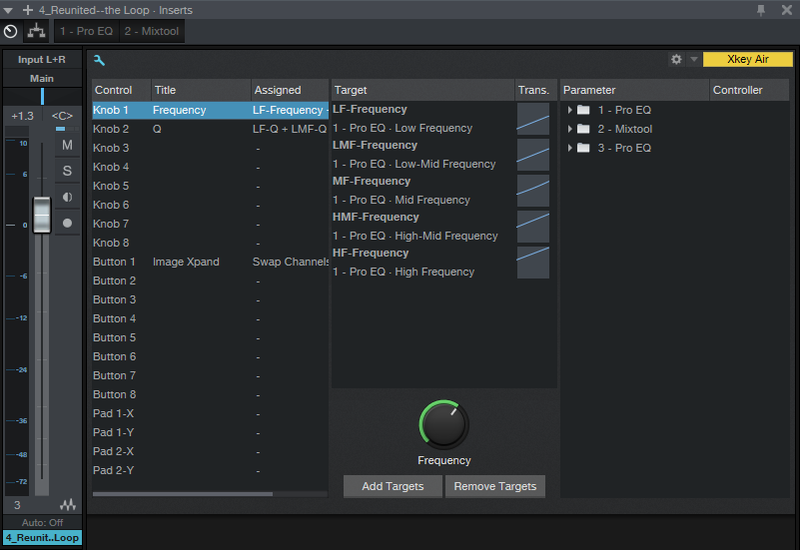 And for those without the patience to build their own Imaging Phaser, here’s an FX Chain multipreset you can download. Have fun! Click here to download the multipreset! After mastering a project, I like to check out its suitability in a variety of contexts by listening to it over and over again—in the foreground, in the background while people are talking, while the dishwasher runs, whatever. 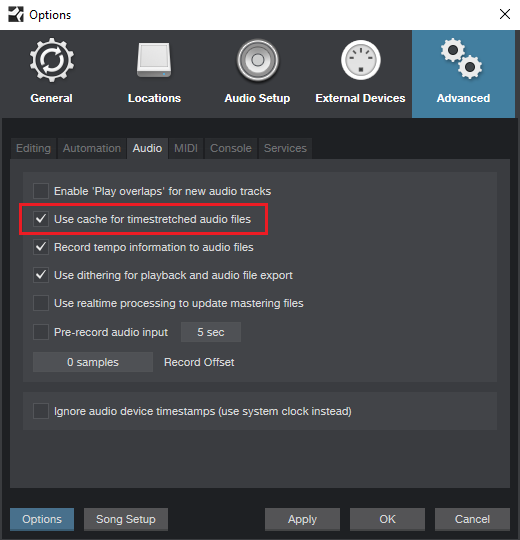 This can be very instructive when trying for masters that are transportable not just for different playback systems, but for different listening conditions. And that’s when it hit me: Bluetooth! I have IK Multimedia’s iLoud portable Bluetooth speaker, and carry it around the house to listen to music that’s streaming from a mobile device. Why not carry it around while listening to a mastered Project? Or even loop a Song, so I can get lyric ideas while the instrument tracks play in the background? Or listen over other Bluetooth devices, to get an idea of the type of sonic violence the music will have to endure at the hand of consumers? Okay, so I was a little slow to tumble to this…but reality checks can indeed be useful, and I hope you find this tip useful as well. We’ll do the Mac first, and then Windows. 1. Choose Apple menu > System Preferences > Bluetooth. 2. 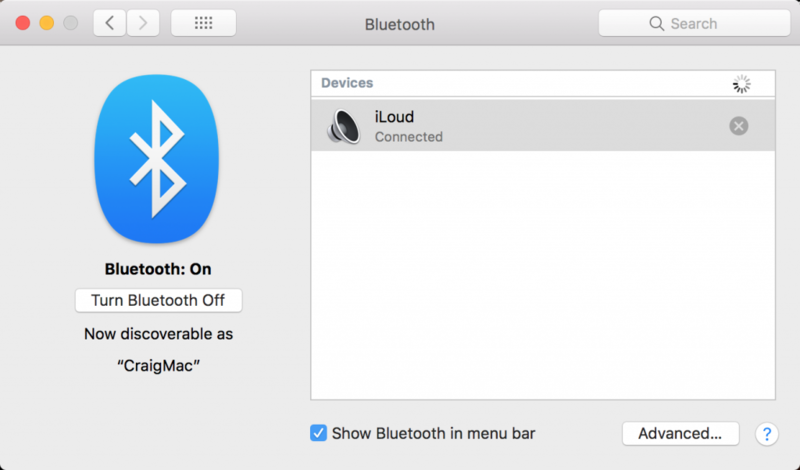 Turn on Bluetooth at the Mac if it isn’t already. 3. Turn on your Bluetooth playback device, and enable pairing for it (usually by pressing a pairing button on the device). 4. When the Connection Request appears, click Connect. 5. The Bluetooth window will show the device as connected. 6. In Studio One, choose Preferences. 7. 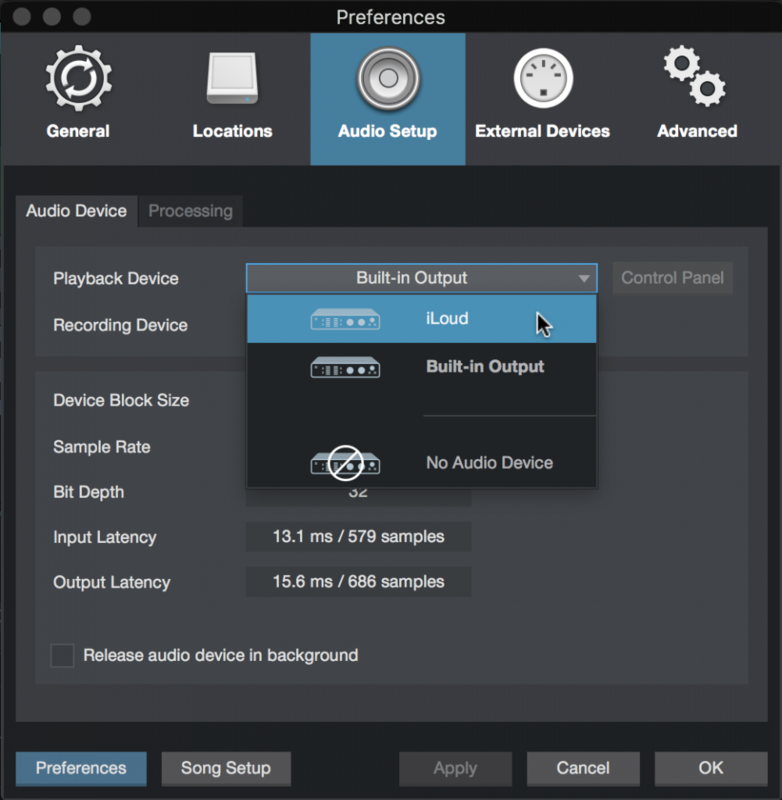 For Playback Device, choose your Bluetooth playback device. 1. Choose Settings > Devices > Bluetooth & other devices. 2. 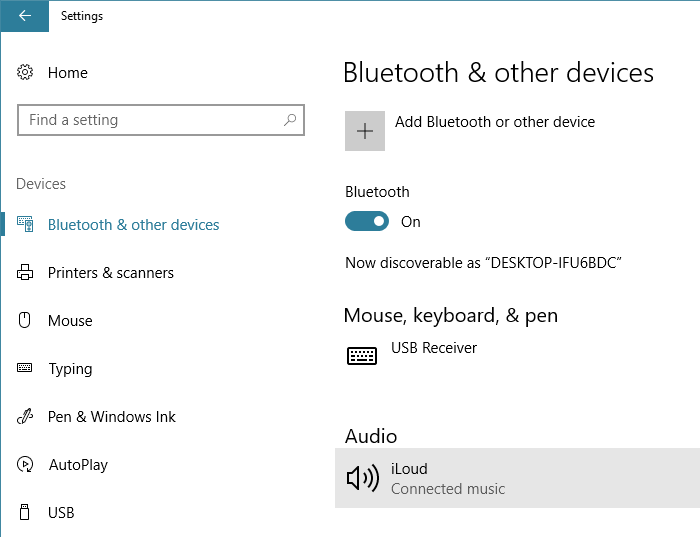 Turn on Bluetooth in Windows if it isn’t already. 3. Click on Add Bluetooth or other device, then choose Bluetooth when Add a Device appears. 4. Turn on your Bluetooth playback device, and enable pairing for it (usually by pressing a pairing button on the device). 5. Click on the device name to connect it. Once it’s connected, click on Done. 6. In the Windows search box, type Sound and then select Sound Control Panel. 7. Your Bluetooth device should appear in the list of potential playback devices. Click on it, and then click Set Default to make the Bluetooth device your default playback device. 8. Now that Windows is set up, open Studio One, and choose Options. 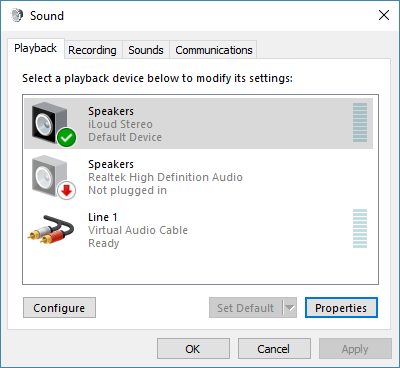 Select Windows Audio for your Audio Device, and you’re good to go.